The Georgia Supreme Court has upheld the state's 2005 tort reform legislation that limits the liability of emergency room medical care providers. The 4-3 ruling turned aside complaints that the law is unconstitutional because it gives special liability exemption to emergency medical care providers, despite general laws governing negligence claims that apply to all other health care professionals. 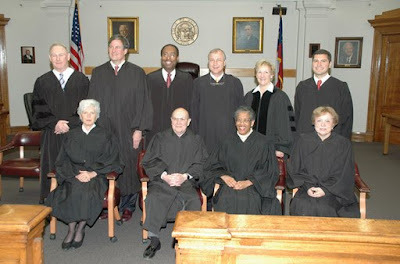 The Georgia Constitution prohibits special laws that are not applied uniformly throughout the state and when general laws on the same issue already exist. But in the high court opinion in Gliemmo v. Cousineau, written by Justice George Carley, the majority found that the statute is a "general law," as opposed to a "special law," and therefore passes constitutional muster. The ER Statue, as the law that was under review is known, was passed as part of the General Assembly's 2005 tort reform package. It states that certain emergency health care providers cannot be held liable unless there is "clear and convincing evidence" they were grossly negligent. "This Court has found a statute to be a special law where it deals with a limited activity in a specific industry during a limited time frame," the Supreme Court ruling states. Georgia's ER Statute "is not a special law affecting only a limited activity in a specific industry during a limited time frame. Rather…it is a general law because it operates uniformly upon all health care liability claims arising from emergency medical care as provided in the statute." The General Assembly passed the legislation in response to the growing difficulty in finding affordable medical malpractice insurance. "Promoting affordable liability insurance for health care providers and hospitals, and thereby promoting the availability of quality health care services, are certainly legitimate legislative purposes," the majority opinion states. "Furthermore, it is entirely logical to assume that emergency medical care provided in hospital emergency rooms is different from medical care provided in other settings, and that establishing a standard of care and a burden of proof that reduces the potential liability of the providers of such care will help achieve those legitimate legislative goals. A trial court judge had also rejected the challenge to the legislation but asked for the state Supreme Court's guidance before proceeding to trial. The challenge of the statute stemmed from a lawsuit filed in Muscogee County by Carol and Robert Gliemmo over treatment Carol received in the emergency room at St. Francis Hospital in Columbus from Dr. Mark Cousineau. Cousineau diagnosed Gliemmo with "hypertensive urgency," or greatly increased blood pressure. The Gliemmos later claimed the physician blamed her headache on "stress" and high blood pressure, prescribed Valium and sent her home. The hospital and physician claimed they gave her a beta-blocker to treat the high blood pressure and performed an EKG and blood tests. After her blood pressure went down and she told nurses she felt "much better," they released her. Two days later, her family practitioner ordered a CT scan, which revealed a brain hemorrhage that left her paralyzed. Gliemmo and her husband sued Cousineau, St. Francis and the physician's employer, alleging professional negligence for failing to order a CT scan that would have detected her brain aneurysm. The defendants argued that the Gliemmos failed to establish that the emergency medical providers had been "grossly negligent," and therefore they were not liable under the state's ER Statute.